Anyone else doing the Cornish course? Well, I’m expecting to be at the St Austell Yeth an Werin on Monday 3rd December when I’ll be in Cornwall briefly, so if you’re around then and can make it that day, it’d be great to meet you! You said “back in Kernow” — is that where you’re from originally, out of interest? I’m Australian myself (now living near London), but I have Cornish ancestry, which is how I came to be interested in the language. My wife will be there as our daughter’s first child is due that day & our son’s eldest daughter will celebrate her birthday the next day. Sadly😔, I am unable to make it. I hope to arrive around the 17th, which means that you and I are unlikely to meet😔. Not doing well, am I? I am from a long Cornish (& Scottish) lineage and was raised ‘down West’ (W. of Truro, that is) as well as St. Awfull as the town is more commonly known nowadays…mainly due to v.poor town development decisions. Enjoy your time there, visit the brewery’s Hicks bar and warn the language group that a crazy Cornishman may be joining them if they have a meeting between 17 Dec & 4 Jan.
Phew, that was a mouthful; sorry about that. Please keep us appraised of developments. Meur ras. No worries, Pincher. Sorry we won’t be there at the same time, but congratulations on your imminent new grandchild! Hope all goes well for mother and baby. as well as St. Awfull as the town is more commonly known nowadays…mainly due to v.poor town development decisions. Er, yes, it is a bit like that, isn’t it… One could happily bulldoze that creepy pedestrianised shopping precinct and start over again with something (hopefully) nicer. But there are still a handful of grand buildings in the town — like the Holy Trinity Church and the Red Bank — plus historic Charlestown Harbour only a short drive away. Actually, I’ve made St Austell my base most times when I’ve been in Cornwall in the last few years, not because the town itself is attractive, but because it’s very central for getting to other parts of the county, and especially because I found a wonderful B&B there a few years ago. Then when it closed (because the lovely Yorkshire couple who ran it were retiring), I unexpectedly found another B&B just as good over the other side of town, so my association with St A is likely to continue for a while yet! and warn the language group that a crazy Cornishman may be joining them if they have a meeting between 17 Dec & 4 Jan.
Do tell, please! By PM if you prefer. Oh, no need to hide it — they advertise online, after all! (Unless it’s against forum policy to post commercial links, in which case I’m happy to remove this and send a PM instead.) Here it is: The Gables Guest House It’s very easy to get to — just off the A390 — and there’s free private parking onsite, which is a huge help if you’re travelling by car (I usually am). Not quite so close to the railway station, but it’s about a 15-minute walk, which isn’t too bad. The room I had was small, but it was cosy and immaculate with a very good private bathroom opposite and one of the comfiest beds I’ve ever slept in. The owners are a lovely couple, Barbara and Mike, who are very friendly and helpful and do great cooked breakfasts. Mike, incidentally, is a Camborne lad and was very impressed to hear I’m learning the Cornish language — “You’re doing better than the Cornish people!” he told me. So I’m sure they’ll be happy to welcome others who are learning the language or who love Cornwall in general. I know The Gables; used to pass it every day…tiz a 5-min (less, actually) from my home (when I go back to Kernow). Sadly, my visit dates in Dec coincide with a break in the language groups/classes😔, but I shall pursue my linguistic studies nonetheless. Speaking of which, my studies are suffering because I have in my possession a variety of study materials (UCR, UC, KK, KS, SWF) which are clouding my mind. Clearly, the reason why I am not progressing is the contradictory teachings insofar as (primarily) spelling and grammar are concerned. What should I do? Is there one form that I should study? I am not keen to study KK because of experience gleaned during the SWF phase (circa 2006-07). Apart from that, I enjoyed tinkering with UCR and have been grateful to Janice Lobb for providing Cornish lesson via email from time-to-time. Hi again Pincher! Nice to hear you know The Gables — I’ll be staying there again myself this coming weekend. Yes, I’m afraid that’s the toughest thing about studying Kernewek — all the competing spelling systems. It’s a bit of a nightmare when you’re learning, I totally agree. That said, if you’re studying the language seriously, the most useful / realistic choice would have to be either Kernewek Kemmyn or Standard Written Form, or a mixture of both — basically because they are used by the vast majority (80% is the estimate I’ve seen) of Cornish speakers and learners nowadays. Both those systems are supported by the largest Cornish language advocacy group, Kowethas an Yeth Kernewek (the Cornish Language Fellowship), and also by Kesva an Taves Kernewek (the Cornish Language Board), which holds the official written and oral exams in the language. I’ve mostly been learning Kernewek Kemmyn myself, largely because it’s ultra consistent when it comes to working out the pronunciation from the spelling. SWF is very close to Kemmyn — if you can read one, you can easily read the other, as they’re very consistent in where they differ (the most noticeable points are that SWF has fewer double consonants and uses “oo” rather than “oe”). There have been a few ongoing debates about SWF spelling — it’s already had some revisions and I believe there are still calls for more, which is the main reason I’m still doing my own studies and exams in Kemmyn. But I’m gravitating more towards SWF as it evolves, and I get the clear impression that that’s the way more and more Cornish speakers, especially new learners, are going. I’d say most people now are on board with the idea that we need an agreed-upon standardised spelling system — even if it means a lot of compromising — far more than we need the in-fighting that’s been going on between different spelling factions over the past few decades. I see you mentioned KDL in your list — I’m currently doing KDL New Second Grade. I’d certainly recommend the new version of KDL, which is much easier and progresses more logically than the old KDL course. It’s available in both SWF and Kemmyn. Oll an gwella dhis and have a wonderful time in Kernow next month with your family! I have before me, a copy of Dyskansow Onan-Seyth of the KDL (new) Second Grade in Kernewek Standard (KS) form. Let us see how that goes. Sounds good! I was just wondering there, though — did you mean KDL New Second Grade in Standard Written Form (called FSS on the Kesva’s website — Furv Skrifys Savonek)? Kernowek Standard (KS) is a different spelling system, one that was proposed during the development of SWF but most of their recommendations weren’t taken up (there’s a Wikipedia article with the details). I’m aware that KS is used in the Desky Kernowek course, and the advocates of it have translated and published quite a lot of books in KS spelling, but it’s completely different from Kernewek Kemmyn and SWF — which, again, are the most widely accepted systems and the way most of the language field is going now. As far as I know (having had a look online), KDL is only available in SWF / FSS or KK. Just a little concerned because if someone has taken the KDL lessons and transliterated them into Kernowek Standard, that might be a breach of copyright. Courtenay - thank you, my mistake. All/Oll - I do not have a KS copy of the KDL materiel. The copy I hold is the FSS version. Confusion regretted. You’re welcome — don’t worry, I agree, it does get confusing with all the different systems, particularly when there’s more than one called “Standard”! Hope you get along well with KDL. It’s worth knowing they assume you also have access to dictionaries — I’ve noticed that occasionally new words are introduced (or knowledge of them is assumed) without a translation being given. There’s a Standard Written Form Cornish Dictionary available online, which is quite useful and I believe it’s due to be updated soon, as there’s a newly published revised edition of the official SWF dictionary in book form — handy if you like to have a version in print. I think it’s largely just single words, not whole sentences — different themes like animals, transport, colours, jobs, food, drink, etc. The spelling is Standard Written Form. Incidentally, one thing I’ve just learned from it is that there’s a new (or at least new to me) Cornish word for aeroplane: “ayren”. Previously I’ve only seen either “jynn-ebron” (literally “sky machine”) or “ayrplen” (direct borrowing from English, which a lot of Cornish speakers try to avoid). I quite like “ayren” — easier to say, still obvious enough what it means, more Cornish-sounding than “ayrplen” and a lot less awkward and primitive-sounding than calling it a “sky machine”! One of the most interesting things about learning a revived and reawakening language is seeing how new words develop like that. It may or may not catch on, but it’s always good to have a few different words to choose from. I’ve just started learning and to be honest, I’ve been getting trapped between Welsh and something that sounds worryingly like an awful Robert Newton impression. Are there any resources where you can just listen to the language being spoken to pick up a feel? For the avoidance of doubt @aran, a feel for the language! Unfortunately there aren’t a lot of Cornish audio resources online (yet), but a couple of good ones are Radyo / Pellwolok an Gernewegva (weekly audio and monthly video programmes) and BBC Radio Cornwall’s weekly 5-minute news report in Cornish, An Nowodhow. 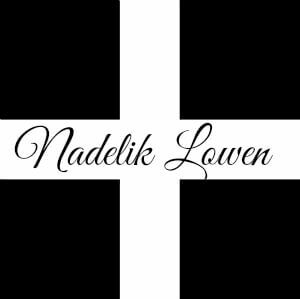 The Cornish Language Fellowship’s website has a link at the top right to access scripts of current and past editions of An Nowodhow, which are really helpful for learners, as they include both the Cornish and an English translation. Hi Courtenay, thanks very much, that’s really useful. I’ll give that a go. Had to log in using the dog’s account for reasons too complicated to explain.